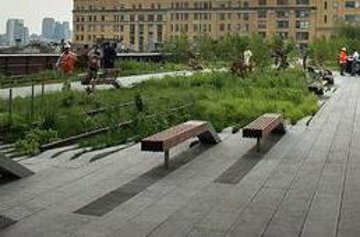 Escape from the hustle of Times Square to the scenic aerial greenway of High Line Park on this guided, 2-hour walking tour. High Line Park is a revitalized piece of New York City’s past, a public park built on a freight rail line elevated above the streets of Manhattan’s Meatpacking District. Hear the story behind New York City’s “park in the sky” from a knowledgeable guide who will offer an insider’s perspective on its history, design and landscape. Walk across the full length of High Line Park with a chance to visit Pier 51. High Line, alias High Line Park, est un parc new-yorkais de la ville de New York construit à Manhattan sur une partie surélevée du vieux chemin de fer central de New York appelé West Side Line. La High Line a été redessinée et aménagée en une voie verte aérienne et un parc de pistes cyclables. Cette visite à pied de deux heures couvre tout le parc, depuis le Tiffany and Co. Foundation Overlook - avec une vue vers l’est du district de Meatpacking et vers l’ouest jusqu’au Whitney Museum of American Art - jusqu’à la porte de transport CSX. Entre les deux, il y a une terrasse et plus de vues sur. Un sentier de deux pâtés de maisons sillonne à travers une forêt miniature de cornouillers, de buckeyes, de houx, de rosiers et d’autres arbustes et arbres denses, ainsi qu’un bosquet de magnolias à grandes feuilles, de sassafras et d’amandiers. Il y a même une partie du paysage sauvage qui a grandi sur la High Line avant d’être un parc, comme des pommiers crabiers, des asters, des carex, des verges d’or et des alumroot. Lors de cette visite, vous aurez également la possibilité de visiter le quai 54, où sont arrivés les survivants du Titanic, et l’ancienne usine Nabisco du marché de Chelsea, où le biscuit d’origine Oreo a été inventé. Excellent guide, Bill was informative and good company. Very much felt this was part of the 'real' New York, not the usual tourist trail! I visited N.Y and put in for a number of N.Y tours. I found this to be one of the better ones. Started in Chelsa met Deb, who took us through the markets and explained the history of he meatpackers area, then to the highline. Great idea for disused rail lines, made walking the line easy, deb kept us informed of various buildings and the architecture. Finished up near 34 st, which made it easy to return to hotel. The tour was great. Fred, our guide, was excellent and went out of his way to answer all sorts of questions and gave us good context of the geography and economic changes along the river and throughout lower Manhattan. Despite the rain we had a very enjoyable trip. The local guide Annie was great, lots of information and knowledgeable about the area. Don't bother having breakfast you can pick up some great food as the trip starts with a stroll through Chelsea market . We would recommend this as an excellent way to experience the High Line. We loved our High Line Tour. Annie was a very knowledgeable and entertaining guide. Highly recommended - it was worthwhile to go with someone who can give you a bit of the history and some of the things to look out for along the way. Arrangements for meeting guide were terrible. We went to the High Line but we were supposed to go to a cafe to meet up. Nearly missed the whole thing which would have been an enormous waste of money and very disappointing.